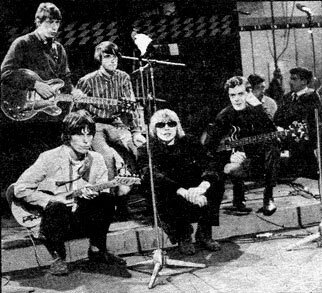 1963 - The Yardbirds were inspired by the Rolling Stones early performances. When the Stones hit the big time, the Yardbirds replaced them as residents at the Crawdaddy Club. The Yardbirds are best remembered for producing the top three English blues-based guitarists of the '60s: Eric Clapton, Jeff Beck and Jimmy Page. Clapton was on board when the group recorded their early bluesy English hits, but he left after recording their first U.S. hit, "For Your Love" (No. 6, 1965). Jimmy Page, having turned down the invitation to replace Clapton, recommended Jeff Beck as lead guitarist. Original bassist Paul Samwell-Smith quit in summer 1966, and guitarist Chris Dreja switched to bass, leaving room for Page, who was present for the recording of the group's last hit, "Happenings 10 Years Time Ago" (No. 30, 1966). 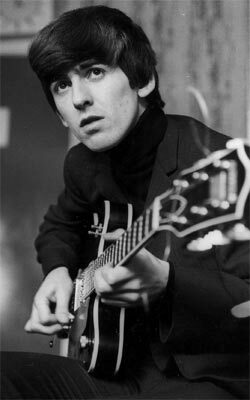 Beck was fired in 1967 for missing shows because of illness. In 1968 drummer Jim McCarty and singer and harmonica player Keith Relf left the band. Page formed the New Yardbirds; that group eventually mutated into Led Zeppelin. The Beck/Page Yardbirds made their live debut on tour with the Rolling Stones. Beck and Page were amplified apparently three times as loud as the Stones and nobody had ever witnessed anything like this twin guitar line up before. the audience reaction to the powerful sounds of The Yardbirds was so great that they wouldn't let them off the stage and would be stomping and screaming for more. This left the Stones seething in the wings as they were the headliner! Jimmy and Jeff had spent quite a while rehearsing "Over, Under Sideways Down" to get a stereo effect from the lead guitars and to hear this blasting out of the speakers must have been quite an experience. In later years we would get use to the sound levels getting higher and higher at gigs with Cream, Hendrix, Deep Purple and of course ex-Yardbirds bands Led Zeppelin and the Jeff Beck group. But by all accounts this really started in 1966 with The Yardbirds. Mick & the boys had their own dedicated Guitarsite page but it has been removed because it was out of date. Led Zeppelin were the definitive heavy metal band. It wasn't just their crushingly loud interpretation of the blues -- it was how they incorporated mythology, mysticism, and a variety of other genres (most notably world music and British folk) -- into their sound. Led Zeppelin had mystique. They rarely gave interviews, since the music press detested the band. Consequently, the only connection the audience had with the band was through the records and the concerts. More than any other band, Led Zeppelin established the concept of album-oriented rock, refusing to release popular songs from their albums as singles. In doing so, they established the dominant format for heavy metal, as well as the genre's actual sound. In August of 1979, Led Zeppelin played two large concerts at Knebworth; the shows would be their last English performances. In Through the Out Door, the band's much-delayed eighth studio album, was finally released in September of 1979. The album entered the charts at number one in both America and England. 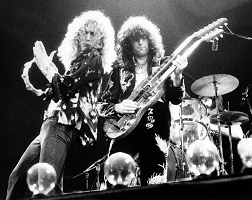 In May of 1980, Led Zeppelin embarked on their final European tour. In September, Led Zeppelin began rehearsing at Jimmy Page's house in preparation for an American tour. On September 25, John Bonham was found dead in his bed -- following an all-day drinking binge, he had passed out and choked on his own vomit. In December of 1980, Led Zeppelin announced they were disbanding, since they could not continue without Bonham. Although Clapton began to gain some media exposure while playing with The Yardbirds he left the band after a couple of years because he felt that they had become too much of a pop group - he wanted to remain loyal to the blues. Clapton formed Cream in 1966 with bass player Jack Bruce and drummer Ginger Baker... continued here. Pink Floyd rose from the ashes of an otherwise forgotten London band, Sigma 6, in 1965. Syd Barrett, Rick Wright, Roger Waters, and Nick Mason toyed with various names, including The Meggadeaths, before settling on Pink Floyd, inspired by American blues artists Pink Anderson and Floyd Council. While Pink Floyd are mostly known for their grandiose concept albums of the 1970s, they started as a very different sort of psychedelic band. Soon after they first began playing together in the mid-'60s, they fell firmly under the leadership of lead guitarist Syd Barrett, the gifted genius who would write and sing most of their early material. The Cambridge native shared the stage with Roger Waters (bass), Rick Wright (keyboards), and Nick Mason (drums). The name Pink Floyd, seemingly so far-out, was actually derived from the first names of two ancient bluesmen (Pink Anderson and Floyd Council). And at first, Pink Floyd were a much more conventional act that the act into which they would evolve, concentrating on the rock and R&B material that were so common to the repertoires of mid-'60s British bands. Pink Floyd were the premier space-rock band. Since the mid-'60s, their music has relentlessly tinkered with electronics and all manner of special effects to push pop formats to their outer limits. At the same time they have wrestled with lyrical themes and concepts of such massive scale that their music has taken on almost classical, operatic quality, in both sound and words. 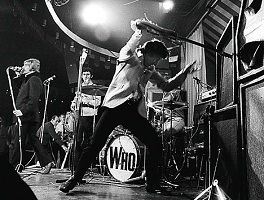 Few bands in the history of rock & roll were riddled with as many contradictions as The Who. All four members had wildly different personalities, as their notoriously intense live performances demonstrated. The group was a whirlwind of activity, as the wild Keith Moon fell over his drum kit and Pete Townshend leaped into the air with his guitar, spinning his right hand in exaggerated windmills. Vocalist Roger Daltrey strutted across the stage with a thuggish menace, as bassist John Entwistle stood silent, functioning as the eye of the hurricane. These divergent personalities frequently clashed, but these frictions also resulted in a decade's worth of remarkable music. Founding members of Wishbone Ash - Andy Powell and Ted Turner were voted among the top 20 guitarists of all time by Rolling Stone Magazine. In 1966 Martin and Glen Turner met Steve Upton. Soon afterward, the trio changed their name to Tanglewood and moved from their native Exeter to London, where they opened for former Yardbirds vocalist Keith Relf. Into that club wandered Miles Copeland. Steve was a jazz-oriented drummer, and Martin Turner's bass was very far out in front of the mix. Martin played melodically with a pick, in the English style of Jet Harris (of the seminal British group, The Shadows), Paul McCartney, and later Sting." Copeland offered to manage the band. Powell was a veteran of various semi-pro blues and soul outfits, and a player who listened to bands from Fairport Convention to the Who. "Pete Townsend had a profound impact on me as a rhythm player", Powell said. He credits his experience in soul bands, working with horn section harmonies, with inspiring the dual lead guitar format that he and Ted Turner developed. David "Ted" Turner (no kin to Martin) had also played with a blues band, and was influenced by American blues players such as B.B.King. The rhythm section , Martin Turner and Steve Upton, was into more progressive groups and was "hugely impacted" by Led Zeppelin. Martin was also influenced by the Who's John Entwhistle. From that disparate combination of elements came the distinctive sound of Wishbone Ash. The Beatles were the most popular and influential rock act of all time, but their significance cannot solely be measured in sales records (as impressive as those are). They synthesized all that was good about early rock and roll, and changed it into something original and even more exciting. They established the prototype for the self-contained rock group that wrote and performed their own material. As composers, their craft and melodic inventiveness were second to none, and key to the evolution of rock from its blues/R&B-based forms into a style that was far more eclectic, but equally visceral. In fact, the song is not about drugs at all. The title was inspired by then four-year-old Julian Lennon. He brought home a picture he drew in nursery school, and told John it was his friend, Lucy, in the sky, with diamonds.